Bhadrak (Orissa), June 14 (IANS) — An estimated Rs.2.6 million ($56,500) was spent on the construction of the temple, out of which Rs.1.2 million came from Parker himself, while the rest was contributed by devotees from both India and abroad. “I decided to build the temple of Lord Jagannath with life-size idols identical to those at the Puri temple because of the Puri temple’s policy to bar foreigner devotees from entering the temple and having a ‘darshan’ of Jagannath,” Parker told IANS. “Thousands of devotees from abroad visit Puri to receive the blessings of Lord Jagannath though they are forbidden to enter the temple,” said Parker, who has renamed himself as Jahnava Nitai Das after becoming a devotee of the International Society for Krishna Consciousness (ISKCON). Parker, the 30-year-old son of a doctor, has founded ‘Bhaktivedanta Ashram‘ to disseminate spiritual knowledge and perform social services. The ashram has three branches in India – in Orissa, Andhra Pradesh and Tamil Nadu. The temple construction, initiated in February 2004 by the ashram, was completed last month. The new temple has three idols Lord Jagannath – a form of Lord Krishna – his brother Balbhadra, and their sister Subhadra. Each idol is seven feet tall. The new temple follows the historic one in various rituals and daily schedules. In fact, the idols were prepared in Puri and were installed by priests of the legendary temple themselves. 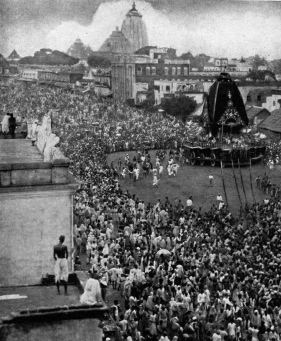 From next year, the new temple will also organise the Rath Yatra, or the chariot procession, on the lines of its famous counterpart, according to Parker. “We plan to set up another grand temple for Lord Jagannath in Bhadrak town, with an 8,000-square-foot hall, and a 110-foot tall dome,” the American devotee said. The project is expected to cost Rs.30 million.